This dress is a stunner and full of amazing details! It has an empire waist and a low neckline that is extremely figure flattering. 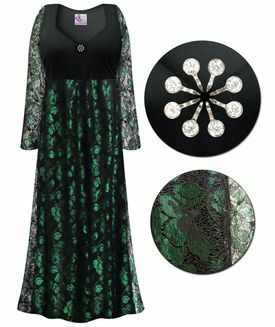 The black bodice is made of a lycra blend material in a black color while the skirt and sleeves are made of a gorgeous black & green lace fabric. The skirt part has a black liner. A rhinestone circle in the center of the neckline adorns the black bodice, it measures about 7/8" in diameter. Available in sizes Lg to 8x in customizable lengths. The standard length is 52". ** These dresses run big. To ensure a proper fit, please take your measurements & compare to the size chart below. Measurements are always taken "unstretched". Please note that this item is custom made to order and takes approximately 4-7 working days to make. Rush options are available. Shipping charges are separate and can be chosen at checkout.